It was an amazing day and an amazing evening. There is simply so much to tell that I won´t be able to get through it all in one BLOG posting - but I will summarize the results in this post and try to go into detail when I have a bit more time. My Pacific Region team won the one event that we wanted to more then any other - the on the water SAR exercise - which is really the only event that relates directly to what we do day to day and has left me thrilled! Kellei lead a team of two Americans over twice her age that she had never met before and won 2 events (SAR pump and Marlinspike) and the International Can-Am trophy - she was beaming! 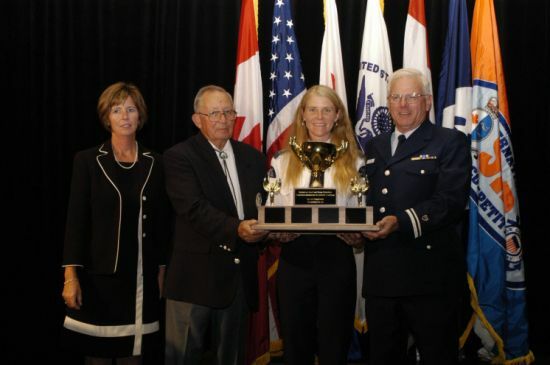 Shawn took the lead of team Canada (a composite team of members from four of Canada´s five regions) to take the win in 3 events, the National, and the overall 2005 ISAR trophy. I don´t think anyone at the table could have been happier. I must leave now for breakfast with all these happy people and the members visiting from the Irish Coast Guard who have become Fast friends of us all.